Now that you have your WordPress installed and running, it’s time to look at some basic settings for your site. The place that you will access the settings for your site is called the WordPress Dashboard, and it provides the starting point for accessing all of your sites dials and knobs. When you change the Blog title and tag line, they will show up at the top of your site. Depending on what theme you use, the title and tag lines will show up in various places. In the case of some themes, they might not show up at all depending on whether they allow custom configurations. We won’t worry about that for now. If you use the default theme (currently “Twenty Seventeen”), the blog title and tag line are both in the lower left of the main page. WordPress, by default, also creates “Category Pages” and “Tag Pages” that display all the Posts in a category or tag. These are NOT related to the regular Page type. Uploading: You can upload the files into your site’s Media Gallery and then link to them in your posts/pages. This works very well for images, and when you take this approach for images you have the added benefit of being able to make use of WordPress’ built in (albeit rudimentary) editing tools. Also, when you upload images to WordPress, it automatically creates different sizes that you can use, as needed. When it comes to audio and video, we only recommend uploading small/short files. Video file especially can take up lots of space on your server, so use services like YouTube for your video needs. If you want to have your media (audio or video) files actually show up in a “player” (with controls for stopping, pausing, etc.) you just need to add them to a post or page using the Add Media button in the editor. How people view/listen to them will depend a bit on the setup on their own computer and in their own browser. They may, for example, have to download the media file and then open it in another program on their computer. Embedding: You can embed media from other sites easily in WordPress. Embedding an image just means providing a URL to it’s location elsewhere on the Web. 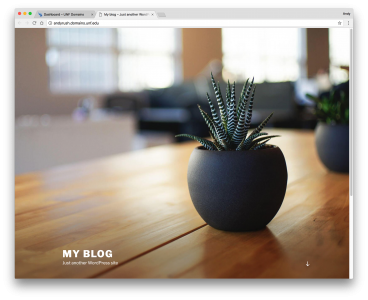 Instead of uploading it to the server, WordPress grabs that image from the external source and displays it on your post/page. However, with this approach you lose your editing capabilities as well as the resizing feature. Embedding audio and video from external sources becomes easier with every version of WordPress it seems. These days, you can embed video and audio from many external services (YouTube, Vimeo, SoundCloud, etc.) by simply placing the full URL of the audio/video location on it’s own line in your post/page. There is a complete list of supported external services, and you can learn more about embedding from external sources at the WordPress site. Our general advice is to use externally hosted media whenever it makes sense and works. This is usually the case when you need to use audio or video. Part of the popularity of WordPress is how easily it makes a website functional and yet attractive. One of the smaller details that you might want to adjust is how the addresses to your blog posts are structured. Permalink is the name given to the address of an individual blog post because they are “permanent links”. For example, the web address for this sample blog is https://andy.domains.unf.edu. The link to the first post (you’ll have to scroll a bit to see it), titled “Hello World” may be structured in many ways. So https://andy.domains.unf.edu/?p=1 or https://andy.domains.unf.edu/uncategorized/hello-world/ both get you to that blog post, but the first example is not a very informative link and the second one is a bit long. With WordPress, you have many options to form the links to posts, and you can change them to make them more simple. To change the permalink structure, start by going to the Dashboard. As you can see, there are several choices under Common Settings. A popular choice is to use the Post name choice, which is a bit more informative. So our post titled “Hello World” will have an address of https://andy.domains.unf.edu/hello-world/. Widgets are a more advanced feature of WordPress that allow you even more control over the content on your site. In essence, widgets are small containers of content that can be placed in various areas of your site. Where you can place widgets depends entirely on the theme you are using. Many (most) themes include at least one “sidebar” into which you can place widgets. Some themes include additional “widget” areas. The best way to find out what areas are available to you is to go to Appearance > Customize > Widgets and take a look at the areas listed on the left. Each widget area will appear on your site as a box on the right. In the example of the UNF Faculty theme, it contains a widget area called Sidebar. You will see a number of widgets available to you. WordPress comes with some default widgets. Other widgets might become available when you have a particular theme activated. Finally, some plugins provide additional widgets to you. When you’re ready to start using widgets, all you need to do is go into the widget (such as Sidebar) and then click the Add a Widget button. Click the Widget you want to add and then click Save & Publish at the top. WordPress will then display your new widgets. Text: Allows you to type text into the widget. You can download a WordPress mobile app from the iOS App Store or the Google Play Store for your mobile device. With these apps you can do many of the things you can do with the administration interface, including writing blog posts.